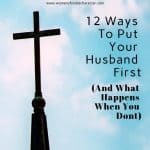 There was an entire week last year where my husband asked me, “What’s for dinner?” It was around 6 pm each night and let me tell you how overwhelming that feeling is. Not knowing what was for dinner or what I even had in my fridge is overwhelming. 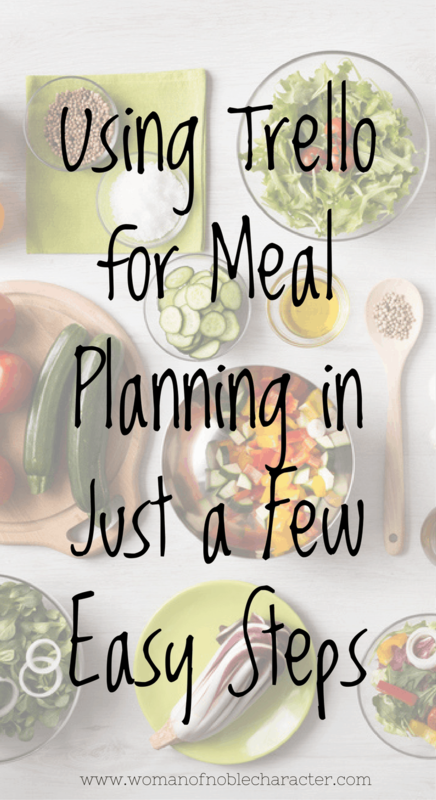 In fact, keeping up with meal planning can be overwhelming for a lot of ladies that I talk with. Then I had a lightbulb moment to use a free tool that I was already using daily for meal planning. Not only was it digital, but it’s a visual tool. 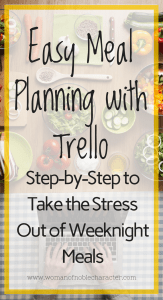 It’s called Trello and I’ve fallen head over heels in love with meal planning in this tool. So how do I use this tool to meal plan? In a nutshell, you create an account, then create a board and add recipes as cards. But let’s back up before we get to the meat and potatoes of this process! When you commit to getting into a meal planning routine you will want to find a day during the week to do your planning. This will help you to stay consistent and build your new routine into a habit. Easy enough, right? So look at your week and determine what day works best for you. For me, it’s Saturday or Sunday mornings before breakfast while I drink my coffee. I can sit and make my grocery list before the kids get out of bed while I drink coffee. This will allow me to not forget to add things to the list. 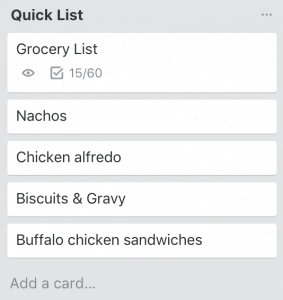 When you start using Trello to meal plan you are going to have to get organized first. As you run out of things in your pantry then add them to the list. It might also suit you to keep a running list of pantry staples and stock up on those regularly. Next, you’re going to gather all of your recipes. I know, I know this can be cumbersome. If this will be too much work I would simply start by gathering your family favorites first. If they are in a recipe book it’s easier to just snap a picture of the recipe and directions. 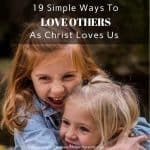 If they are on Pinterest or online somewhere else then you will want to grab those links. Once you’ve gotten through this step you’re ready to get started on the fun part. Getting organized in Trello is both fun for me and addicting because it’s something I’ve grown to love. Before you can dive into the “meat” of organizing meal planning with Trello, you’ll need to get Trello. You can grab a free account HERE. 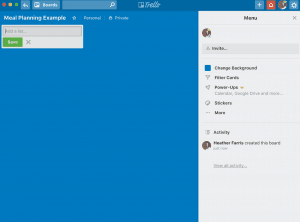 When you first sign up for Trello you are going to start with a blank slate. First, you need to create a board. 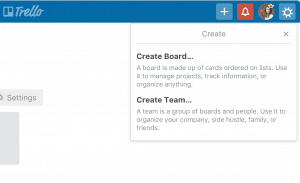 In the top right of your Trello navigation, you click the plus sign and choose to create a board. From there you will have a new blank slate to create magic within. Next, you want to start creating lists. You can do organize this is whatever way makes your heart happy. You can see how I created my board and organize it right here. At this point, you simply start adding your recipes. Inside of the card, you will see the various options to input your information. I like to put the recipe directions in the description at the top and the ingredients in a comment or checklist. If you click attachment button on the right side menu of the card you can add a link to a recipe. 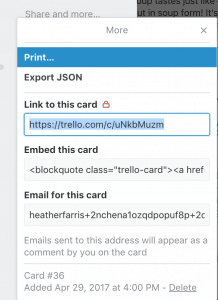 You can also add a link in the comments section and Trello will pull an image from that URL so you have a visual of the recipe. 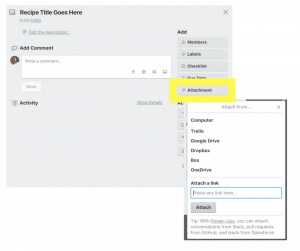 In this menu, you can also add other attachments such as images. You can see an example below. You will do this for all of the recipes that you want to add to your database. If you want more detailed instructions you can see how I do it over here. Now that you’ve got recipes in your database you can start meal planning with Trello. I like to add due dates to each of my cards so I can meal plan for a week or two at a time. In Trello you can use the calendar function to see your meals in a calendar format. You will need to go into the board settings and turn on the calendar power-up shown below. Once you have this feature turned on and due dates on your recipes then you can see them in a calendar format. I like to make a list of meals for the week. At the top of that list I add a card for my shopping list and below it, I just drag and drop my recipes that I want to have for the week into that list. Inside of the shopping list, I simply add a checklist and start adding my ingredients to that checklist. I break it out my department of the store so it flows nicely but you can do whatever fits your needs here. Once I am finished with my list I like to print it so I can take it straight to the store with me. It prints nicely with checkboxes and all. You do this by clicking share and more inside the card on the bottom right. Then the top menu item says print. That’s it! 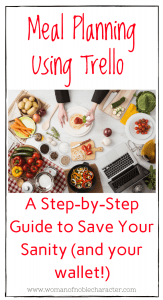 Once you get the hang of using Trello you will easily be able to build out your recipe database and make your meal plan and grocery list all in the same place! What’s even better about Trello is their phone app. If you’re out and about and need to make a quick meal plan then you can use your app to do it on the go! Note from Sue: If you want to learn more about using Trello to manage your family and home, I HIGHLY recommend Heather’s course Trello for Family! You can literally use Trello to manage everything in your home from calendars to meals to cleaning and back to school. Heather will show you how. 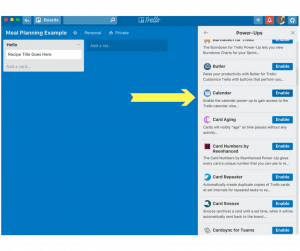 She’s an amazing teacher and you will LOVE using Trello to get organized. Heather is an entrepreneur, blogger, and mom of two. She and her husband live in the Midwest where he is stationed in the Air Force. 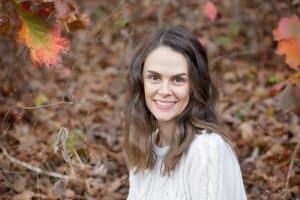 On her blog, TheBalancedMamas.com, Heather helps other moms build a balanced home and enjoy more quality time with their families by building systems and routines. She does this by providing practical solutions that moms can implement quickly so they can get back to spending time with their family. For great resources on food storage, holiday meal planning and more, check out Fabulously Festive Meal Planning Pack.